In order to achieve our Environmental Vision 2030, the LIXIL Group has committed to reducing the environmental footprint of our business operations through launching a Group-wide Environment, Occupational Health and Safety (EHS) management system. In 2016, the LIXIL Group announced its Environmental Vision 2030 medium to long-term targets, and established the LIXIL Group Environmental Sustainability Principles to define our environmental philosophy and code of conduct. By 2030, we aim to secure an overall net zero balance between the environmental footprint of our business and the positive environmental contribution we make through technological innovations and the development of low-carbon, water-saving products and services. To achieve our Environmental Vision, it is vital that we operate an effective environment management system, and work to reduce environmental impact across our entire business, from raw materials procurement through product disposal. In 2016, we started operating under our newly established EHS Performance Reporting Guidelines to help strengthen Group-wide target management and monitoring systems. 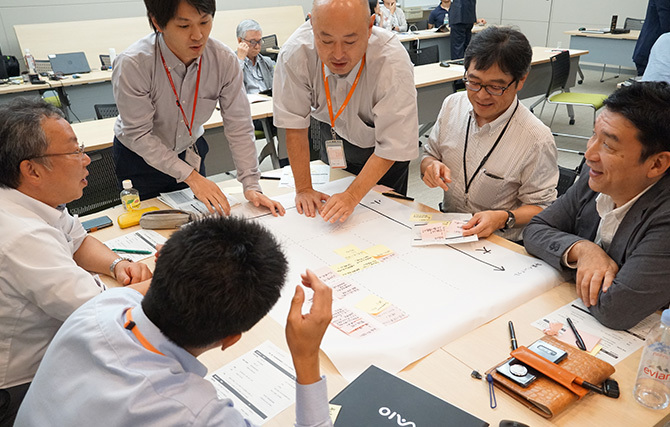 We are looking to actively reduce environmental impact across the Group by extending activities currently implemented in Japan to all global operations. With the desire to help people live in harmony with the Earth, we are committed to continuing our proactive efforts to help create a sustainable society through every process of creating a better home. Group EHS Committee The LIXIL Group has set up the Quality & EHS Division under CEO’s direct supervision, making group-wide efforts to develop our EHS management system and promote our environmental vision. Under employees responsible for EHS staffed in each business organization, EHS activities are promoted within the organization and at the consolidated subsidiaries. To promote group-wide EHS-related activities, the Quality & EHS Division acts as the secretariat to hold the Group EHS Committee meeting. The committee covers all business organizations and head office functions, as well as the consolidated subsidiaries. In cooperation with the LIXIL Group Executive Officers Meeting, LIXIL Corporation Board of Directors, and the CR Committee, the Group EHS Committee is establishing and expanding the scope of the EHS management system in the Group, including promotion of environmental strategies and development of effective management and reporting lines. The LIXIL Group operates an internal audit system covering the entire company. Its manufacturing factories conduct internal audits according to ISO14001 standards and check the effectiveness and compliance of environmental management systems. With regard to non-manufacturing divisions and Group operating companies, we perform internal audits based on the standards set in our own environmental management system and are gradually expanding the scope to include Group subsidiaries. We work to ensure the effective operation of our management system by following up on all audit points and confirming the implementation of improvements. From FYE2018, LIXIL’s EHS Management Division started auditing employees responsible for EHS in all business organizations. This includes auditing the status of EHS management, including compliance within all business organizations, in order to strengthen the group-wide governance. LIXIL Corporation strives to inform and educate employees at various levels of the company about environmental initiatives. The company conducts environmental training for new recruits, provides Environmental Management System (EMS) training for EMS promotion managers and operators in each office, and distributes monthly reports on environmental trends to top management, including directors, auditors, and the CEOs of technology businesses.